I haven’t been the best food blogger the last few days! I spent the first part of this week in Baltimore at a meeting. I took my camera but did not take any pictures! Luckily the internet is a lovely source for such things. While in Baltimore, I stayed at the Hyatt near the Inner Harbor. 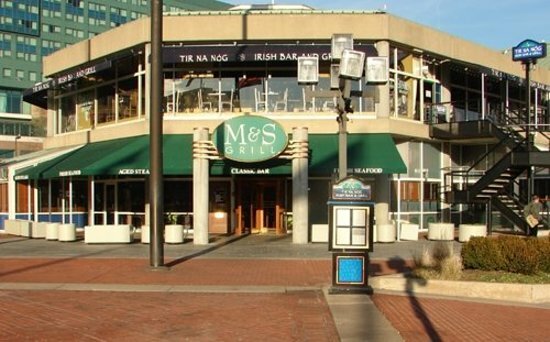 ..And I dined al fresco in the sunny 80+ degree weather by the water at this restaurant on the lower level of this building, M&S Grill, at which I enjoyed a crab cake sandwich for lunch. When in Rome Maryland, right? The weather was glorious and the crab cake was savory and delicious, crispy outside, and a soft and lumpy meaty interior. ..And then for dinner I dined in the UPSTAIRS of the above building, at the Tir Na Nog restaurant, for a late evening dinner enjoyed, again, outside. Guess what I had!? MORE crab! Crab cake entrée! Huge lumps of crab. 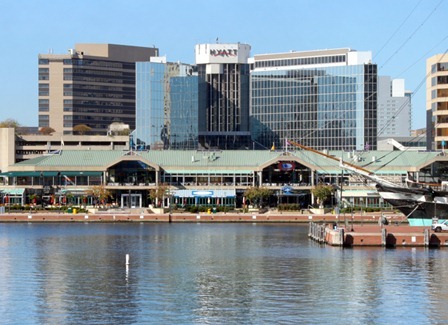 View of the inner harbor area. Had to resist the desire to take a ride on these guys. So tempting. Currently listening to: Happiness Is A Warm Gun – The Beatles.